2 Core – 36″ X 150′ 20# Inkjet Bond Wide Format / CAD Roll, 2″ Core, 4 Rolls. 100% Guarantee. Paper size: 36″ wide X 150′ long. Core Size: 2″. Color White. 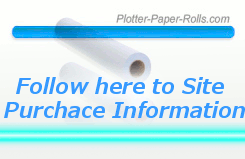 Roll Plotter CAD Papers 730 X 150′ Core 2″ works best from us American made. You will find our Rolls in top Plotter Papers printer ready 30″ Premium Coated, Uncoated US made plotting Papers produce clear, crisp images! 2 inch diameter core, Untaped,to be spun out on the best equipment calibrated professionally also the idea of demagnetizing Papers and keeps your plotting machine young, 30″ x 150′ 20#LB Plotter Paper (2″ core) no ion charges, less downtime, creating of the best plotter Papers smoothest to the heads of the Papers plotter. Bright White 20 lb opaque Inkjet Bond. Un taped, not taped, no tape on roll, which means the papers is not taped to the core as in ole Xerox days when the taped papers stopped the plotter printer). This quality paper gives you longer life of your paper plotter printer and less issue and hassle. Although we carry them, Plotter heads can cost over $900, therefore “stick with quality”. For almost 2 decades our monochrome inkjet bonds are extensively tested for performance and quality. Plotter Paper 30″ X 150′, 20lb Inkjet Rolls, Over 20 years of tired and true. 4 Plotter Papers rolls in once box means you SAVE! 30 x 150′ Plotter Papers are popular sizes and when protected, as we do, in transit arrive at your door fresh from the factory and ready for Plotting CAD printing on perfect size Plotter Papers rolls.